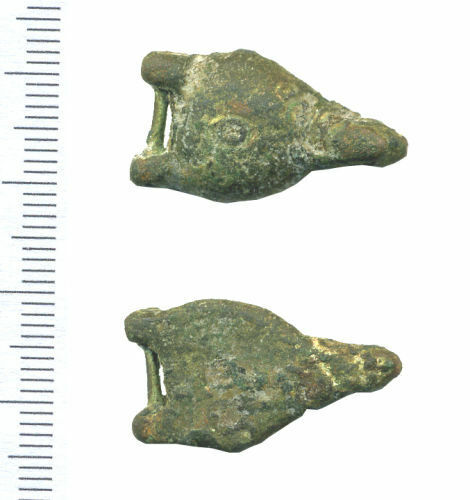 Copper-alloy book clasp, a sub-triangle with a narrowed and moulded knop at the apex; a circular hole runs transversely through the knop but is filled with a copper alloy rivet or pin. The centre of the clasp has a second hole which runs from top to bottom, and this is also filled with copper alloy. This is likely to have fitted over a peg on the opposite book cover and the hole may retain the peg. The base of the 'triangle' has two integral knops, one at either corner, which are joined by a separate copper-alloy bar showing signs of wear. The reverse of the clasp is flat and undecorated, whereas the upper surface is slightly domed. The surface of the clasp is abraded and corroded. It measures 25.13mm long, 14.2mm wide and 4.56mm thick. It weighs 4.82g. The clasp would have been used in conjunction with leather straps to keep books closed when not in use. Egan (1998) illustrates similar clasps, for example No. 922. Egan comments that these clasps date from the late 14th to early 15th century.